When putting, your eyes should be directly over the ball or just behind it. In golf, “eye line” refers to the position of the ball relative to your eyes. On most shots, you position the ball according to the type of shot you’re playing. For example, when you’re hitting a driver off the tee you’ll typically position the ball opposite your front heel. For a short iron you’ll move the ball farther back in your stance. When you’re putting, however, the ideal setup should provide you with a clear vision of the putting line. Golf writer Steve Newell explains that when your eyes are directly over the ball, “you have the best possible view down the line of the putt.” Your eye line, therefore, is a key part of your putting stroke. Vickers terms the optimal eye line and eye movements while putting as “Quiet Eye.” A golfer achieves quiet eye, she adds, when his “gaze remains absolutely still on the ball just before and as the stroke is performed.” She says the eye line should remain constant “through the backswing, forward swing, contact and for almost half a second after the ball is struck.” A poor putter doesn’t maintain a steady eye line. His focus roams and moves too quickly at impact, often toward the front foot. Golf pro Mike Malaska suggests this drill to establish your eye line, using a compass, a tee and a laser pointer. Place a ball on a surface on which you can draw, such as a large sheet of paper. Use the compass to draw a circle around the ball, with a radius of 18 to 24 inches. Set up a target, then place a long white tee on the circle, directly between the ball and the target. Have a helper set up or hold a laser pointer on the opposite side of the circle from the tee, then have her shine the laser so its light runs directly through the ball, the tee and the target. Take your normal stance over the ball and move your head slowly until you find the position where your eye line is directly over the line on the ball. This should be the eye line you use when putting. Newell recommends a simple test to help set your eye line. 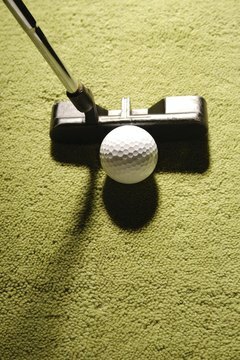 Take your putter and a golf ball onto a practice green. Hold the ball in your right hand, then take your normal putting stance while holding the club with your left hand. Place the ball against the top of your nose, midway between your eyes, then let the ball drop, being careful that it doesn’t hit your club head. Observe the spot on which the ball lands. That’s the place where the ball should be positioned in your putting stance.